Although The Augmented Painting, phase 2 was a success I was curious if I could improve the installation. While the iPad installation was very easy to use I did miss the more playful interaction we achieved with phase 1 of the installation. I decided to use an iPad and Vuforia to track the painting itself as a natural feature, so the special captures can be overlaid directly upon the real painting. For this prototype I chose to use ‘The Bedroom’ again since we had so many captures of this painting available. 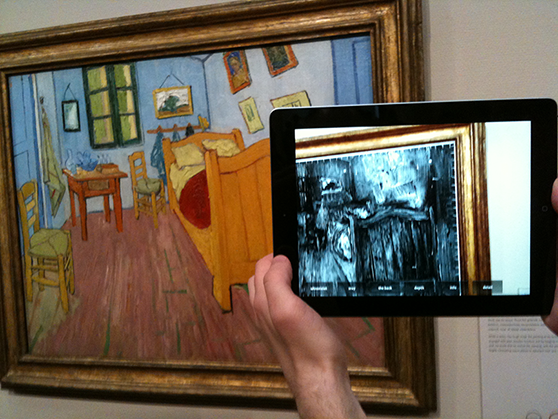 The resulting interaction is very straightforward, by pointing the iPad towards the painting the software recognizes it and overlays the first special capture upon the painting. By moving the iPad closer to the painting you can zoom in on the high-resolution capture and see finer details. A menu on the bottom of the screen is used to select the different captures. Besides x-ray, ultraviolet and the back of the painting I added some new options. 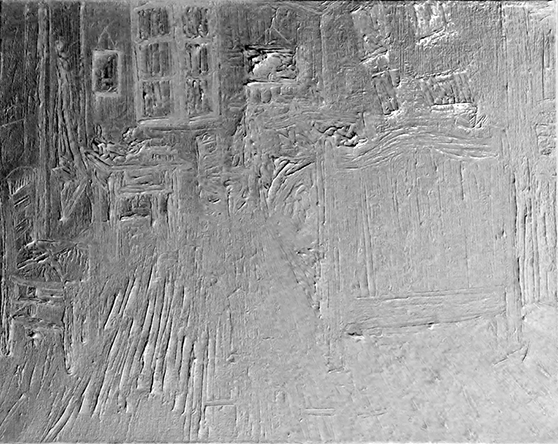 Through processing the photographs with the painting illuminated from the left, right, bottom, and top I was able to construct a heightmap of the painting, an image without colour information showing only the height differences of the paint. This clearly shows the thick splotches of paint which are very typical for Van Gogh’s style of painting. Another new addition is a layer with hotspots which play a pre-recorded verbal narration when touched, which can be used to give extra information about specific parts of the painting. 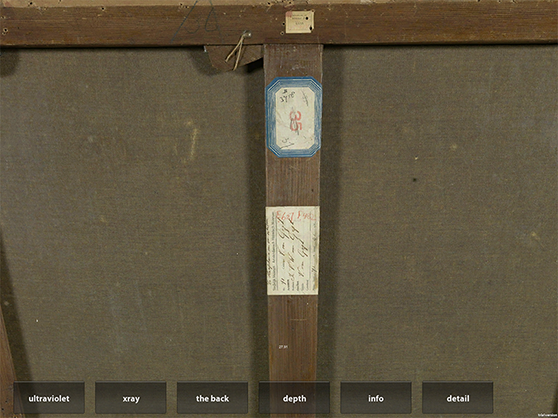 Finally there is a layer with hotspots which allows you to zoom in on a specific part of the painting, revealing for example small cracks of the paint. Currently the application only recognizes a single painting, but it would also be possible to include the whole museum collection. This way the application could even function as a replacement for the traditional audio tour. Instead of walking a pre-determined route or entering pre-defined numbers for each painting one could simply point the iPad towards a painting to identify it and get extra information. The project won the “Best Demo award” at the IEEE International Symposium on Mixed and Augmented Reality (Atlanta, US).